Wow! June 25 was a very sad day for pop icons Farrah Fawcett, whose death was expected, and Micheal Jackson, whose sudden, shocking death was not. As a child of the '70s, both stars shaped my childhood and to this day I cannot sit still when a Jackson 5 song comes on. I travelled along the road with Michael on his journey until "Thriller" came out, then I had to get off the bus as his life and looks became more bizarre. Both characters were undoubtedly quite strange, but they will leave a gaping hole in many lives, nonetheless. RIP Michael and Farrah. Here comes summer! Bring it on! The yearly ritual of collecting our "treasures" has begun as I prepare for the this weekend's Fourth Avenue Street Sale (Friday and Saturday). There are the piles in the cellar and garage left over from last year, then there's this year's pile of things collected over the past year that resulted from further weeding of the kids' stuff and other attic clutter (their motivation is that they get to keep the $$ for whatever they sell). Mark's friend, Scott, will once again be bringing over his fishing samples (rods, reels, tackle, other equipment), so we hope to attract a crowd that way as well. Our goal every year is just to make enough cold, hard cash to go out for dinner (which is not as easy as it sounds when everything is marked from 25 cents to $1). Anything beyond that is gravy! The only unknown: the weather. At this point it looks like rain for both day, as I compulsively check my iPhone weather app for updates. Pray for sunshine!! Leaving on a Jet Plane - Finally! Four weeks from today Mom flies back to the states from her year in Turkey. Hurray! We're looking very forward to her return to Rochester, which will happen after she spends a week in DC looking after Jackson while Dave and Amanda attend a wedding on the west coast. We have so much to catch up on (and so many restaurants to visit)! YOU MUST go to the Royal Cafe in Fairport for their gelato "spaghetti & meatballs" treat! 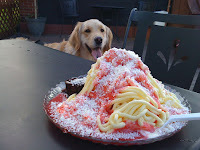 Made from homemade vanilla gelato (the spaghetti), topped with a strawberry puree (the sauce) and shredded white chocolate "cheese," it comes with a side of brownie "meatballs." Annalisse gobbled this full course dessert right down. Give it a try! It's just one more reason to love Fairport!! Could we possibly fit more stuff into this weekend? Is it possible to alter the Earth's rotation to add a couple more hours in each day? On Friday night, it all started with sending Annalisse off for her 8th Grade Finale and heading to the Village for the bands and food that kicked off this summer's Canal Days Festival. As for Cameron, he was long gone, off with Bonnie and her friends. We rose early on Saturday morning to get the kids organized and fed before they headed to the boathouse for an exhibition row through the Village. What fun that was! Then we were back and forth and back and forth between the festival for most of the day. When it came time for our usual evening walk with Jasper, Mark had just about had it and and cut our walk short, heading for home while Annalisse and I walked over to Bonnie's so Jasper could play and run like crazy with his pal, puppy Duke. Well, it's coming up on five years since we've moved onto Fourth Avenue. How the time has flown! I remember back to the weeks leading up to our move from that dastardly housing track with the house high up on a hill (the house was nice, but the location - not so much), and the excitement I felt (it was very physical: heart racing, anxiety, the whole ball of whacks - but in a good way!). We came to a Tuesday old car night a couple of nights before the move and had dinner at the restaurant right on the canal (I can't remember the name right now - it's had a couple of owners since then), and I remember thinking, "In a couple of days, this will be 'us'."